Quick notes to help you get more sales and marketing done in less time. . . next week. My son has started his first sales job and his training stories have dredged up many memories. This week, I’m focusing on objections because they happen everyday, not just in sales. Dealing with push-back in communication is easier on a good nights sleep. Try setting an alarm to remind your night-self to go to bed on time. Teach your people to pause before jumping into an email debate and check that they’re only responding to a single subject. If addressing multiple points, get on the phone. What has happened, will happen. If you get stuck on a particular question, you’ll get stuck again. Brainstorm and write out multiple responses for better responses next time. One feature of highly effective people is they catch on quickly. Next time you interview, jump from one subject to the next. If the interviewee keeps up with you, that’s a good sign they will quickly learn how to work through objections. The speed of your people’s decisions is not dependent on a quirk in their personalities. Ted doesn’t make decisions faster than Mary because she’s more cautious and he’s more carefree. Their daily decisions rely on the interaction of two forces: autonomy and alignment. Autonomy comes from the leadership team. We’re defining it as self-reliance, self-rule, or independence. It’s earned over time. The more your people are given the autonomy to make decisions without direction from above, the faster decisions will be made. Alignment also comes from the leadership team. We’re defining it as positioned or arranged in line with the strategic vision of the company. It’s a communication issue. The more your people are aligned with the strategic vision of the company, the better their decisions will be. Let’s look at this Figure, autonomy and alignment. When we bring up the Ted and Mary examples, the first thing most people think of is a Ted with high autonomy and low alignment. The prima-donna who asks for forgiveness and not permission. We find him in sales, out shaking trees and making things happen. When we think of Mary, we put her in high alignment and low autonomy. The bureaucrat that knows what the strategic vision is, understands exactly what the playing field is, and hides in the middle of it, not wanting to make the wrong call. 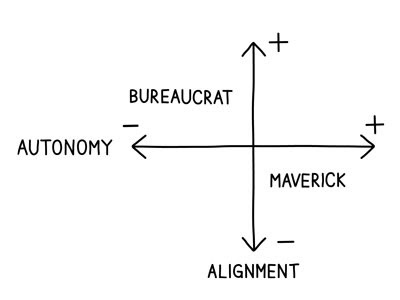 The way to speed up decision making is to move both Ted and Mary into the upper right quadrant. Mary will make more decisions, faster, when she feels that she has the autonomy to make those calls. She benefits the most from understanding her strengths and applying them to the tasks at hand. Ted will make better decisions with the same speed when he knows the playing field boundaries. He benefits the most from understanding the clear vision of where he needs to be and when he has stepped over the line. I visited the ancestral grounds for a memorial service last weekend. Originally I planned on getting there a few days early in order to take advantage of some world class fly fishing on the lower Arkansas river, but plans changed, and I ended up driving straight from Omaha to Leadville in one shot. I loaded up a Lee Child audio book and settle in for the drive. Denver traffic at 3pm is painful, but I get into the foothills and traffic opens up again once I get past Idaho Springs. My sister is 10-30 minutes behind me and I want to text her so her husband can help me push my giant, dead 4WD up to the safe spot. Thoughts are racing through my head, it’s Friday the 13th, it’s 5pm, I just had this car checked, I’m hot, and I’m fumbling with the phone which isn’t responding to my sweaty fingers. I see it’s almost dead, only 1% battery. My flop sweat turns into full-blown stress and I start swearing and texting. Long story short, I’m about to set fire to this heap but decide to give the ignition one last turn and the truck engine roars to life. No error messages, everything working and eagerly awaiting my instructions. I turn off all the electronics, roll down the windows and get up the hill. Then down the hill. Then up to the final destination, Leadville at 10,400 feet, where I pull in front of the rental, still shaking. My sister’s family pulls up 20 minutes later and they hand me an icy beverage to help take the edge off. I must not look happy.